If you’d prefer to spend your Monday morning in the office relishing over your golf pool victory instead of compiling the results from last weekend’s tournament, you definitely need to check out our PGA Single Tournament golf pools. Refresh the scoreboard when golfers finish holes. Your poolies pick their team of golfers online. Easily send an invite to everyone in your pool. Configure your pool with endless options. Draft teams offline and quickly plug them in. More scoring options using best from each day. Project each golfers earnings, LIVE. Choose exactly how your picksheet is setup. Many additional options to configure your pool. 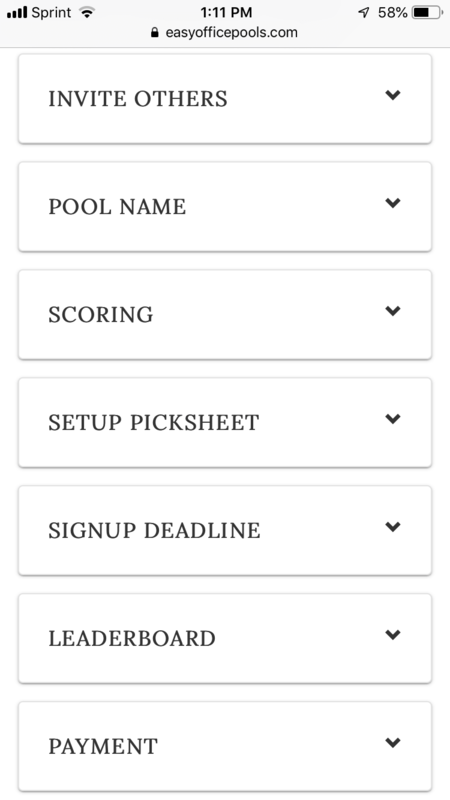 Read below to learn how you can manage your golf pool online, using the custom settings that everyone in your pool loves, without the time sucking spreadsheets and email updates. Click this live example from a previous PGA Major pool using a personalized URL for pool #736. Take back your Monday morning by saving the precious time otherwise spent compiling your golf pool results. Keep all of your pool participants well informed without any manual effort on your part as an administrator. Pool participants can access your personalized web link to get up to date standings. Use your mobile device to track standings. Our website looks beautiful on all devices. You get a custom link that you send to everyone to frictionlessly join your pool. No account creation necessary, just start picking the golfers for your team. Use our default options and have your pool setup in minutes. If you want things more customized you have ultimate flexibility from your pool admin screen. The following features can be configured and utilized for each pool. When viewing results for your pool, you can sort by either your team’s total strokes to par, dollar earnings, individaul rounds, or combination of all the best rounds from each of your top golfers. Unlimited! There is no limit to the number of people that can join your pool. If your pool grows into the 1,000s of people we’ll help make sure it runs smoothly with custom views. 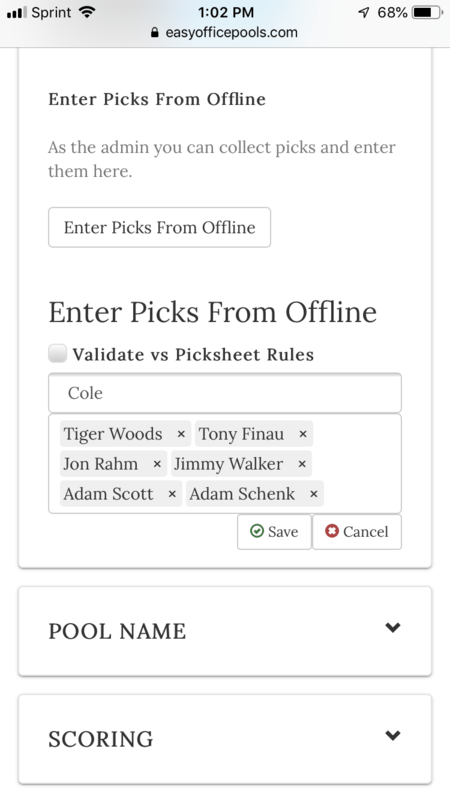 By default we have everyone pick 6 golfers, but you can fully customize your picksheet and let people pick 2 golfers or 50 golfers or anything in between. You can choose to count only the top 4 of 6 from each team, for example. This helps when some of your golfers don’t make the cut … by only using only your best golfers you minimize the impact that those golfers have on your overall score. If a golfer doesn’t make the cut, he can be assigned an 80 for rounds 3 and 4 or the highest score from the rest of the field for rounds 3 and 4. The same rules apply to WD/MDF/DNS golfers. 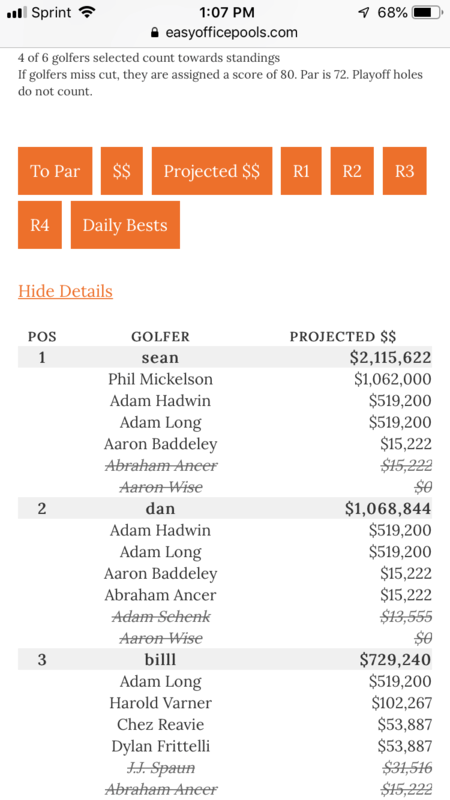 Throughout the tournament projected earnings are recalculated based on the current leaderboard. 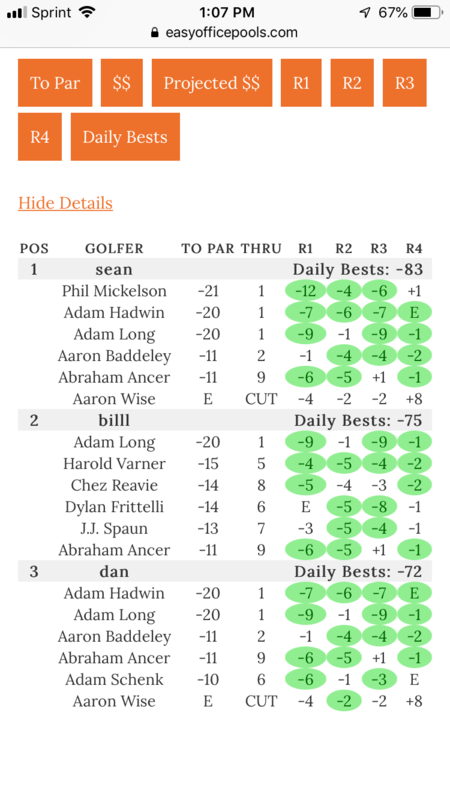 Golfers can be separated into different tiers on the picksheet based on world rankings, or fully customized to place golfers into indiviual tiers. For example, you can split the field into the 3 different groups of golfers. The first group has the 10 best golfers in the field, the second group has the 11th – 30th best, and the remainder of the field is in the 3rd group. You can choose to have 1 golfer chosen from each tier, or 10 golfers chosen from only 1 tier. Or you could customize like 1 golfer from Tier 1, 2 golfers from tier 2, and 3 from the last tier. Up to you. Players in your pool can be ranked based on their team of golfers individual daily rounds. This is fun if you want to have different prizes based on each individual round. 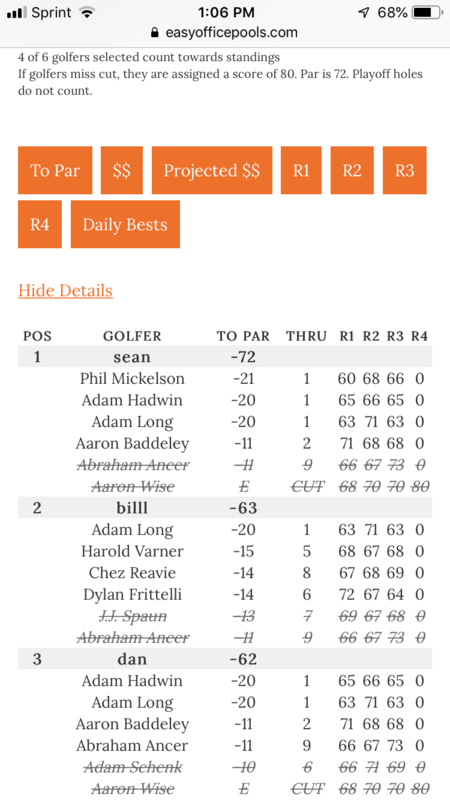 This will give you a summarized view of your pool by hiding all of the individual golfers and only displaying each team’s total score and the position in the rankings. If for some reason you want to allow people to join your pool and edit their teams after the first tee time, you can extend the signup deadline to a date of your choosing. $20 per pool, paid only by the pool admin. Foursomes are free! Pools with 4 or fewer entries are free. This fee is to provide online setup and live scoring. This fee is in no way related to gambling. We do not manage any gambling related activity on our site. Send us an email or comment below if you have questions regarding our golf format or ideas for new features we could add to help get you out of Excel and make your pool managing life easier. Entrants are not be allowed to add or update teams after the first tee off, unless you extend the default signup deadline. Only the admin is able to add or delete teams after that time. If someone’s picks need to change after this time, the admin is responsible to create a new team for them and delete their old team. It is the responsibility of pool admins and participants to monitor player withdrawals leading up to the tournament, and update your teams if one of your golfers withdraws from the tournament. It is up to each pool admin to decide how to score your pool. There are several options on the View page, so make sure your participants know which of the sort options are in play for your pool. Should golf tournaments end in a playoff, the golfers in the playoff will not receive credit for the strokes earned or lost during the playoff. Have a scorecard playoff with the best players on the team. For example, if I have Tiger at -5 and Rory at -3, and you have Bubba at -4 and Phil at -4, then we both have -8 but I win because when we match my best against your best mine is better. For a live listing of upcoming tournaments, check out our PGA Fantasy Tournaments Page. Below is a listing of all of the tournaments we’ve hosted. Pool configuration is available after the field is set for each tournament (usually the Saturday before the tournament). For Major Golf Tournaments, The PLAYERS Championship, and other select tournament the pools are available up to two weeks ahead of the tournament start, when the field is close to final. If you love organizing pools to make sporting events more interesting, but don’t love the time it takes to organize and disseminate the results, get started now by signing up below. July 2013 – Add and remove players from your pool. Create pools for major golf tournaments as early as Sunday. August 2013 – Sort by end of the tournament dollar earnings. May 2014 – Frequency pools update increased from 30 minutes to every 5 minutes. Select up to 20 golfers instead of 10. Count between 1 and 20 golfers towards final score instead of only top 3 or bottom 3. 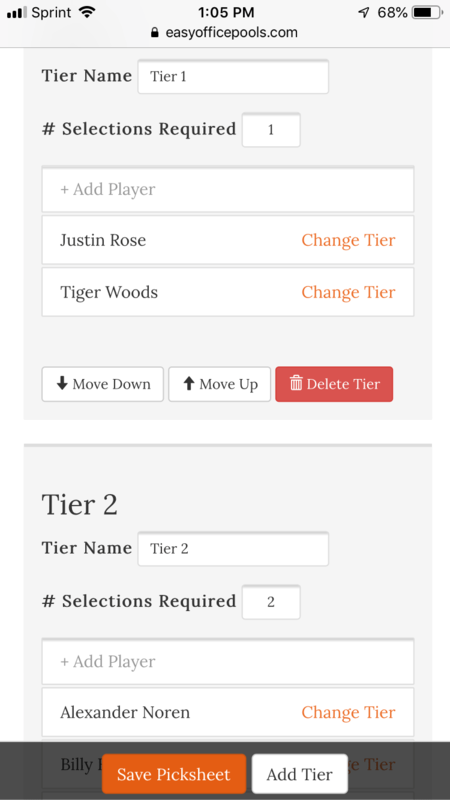 July 2014 – Created golf tier generator that allow you to break out golfers into tiers based on world rankings. January 2015 – Created premium golf pools with picksheets, round by round scoring, picks lock when tournaments begin. February 2015 – Leaderboard view and multiple payment options for premium pools. Ranking position displayed next to each entrant. May 2015 – Tiebreaker question added for premium pools. Added the option to get all entrants email addresses on the admin page. 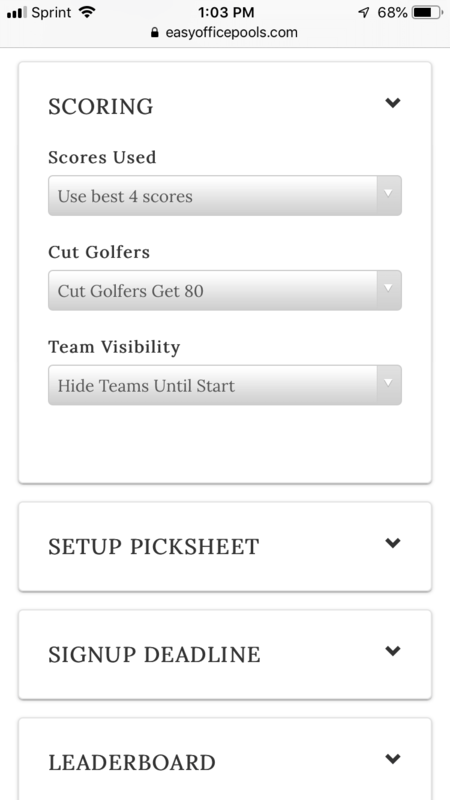 Automatically hide picks before the start of golf tournaments unless the admin wants picks displayed. 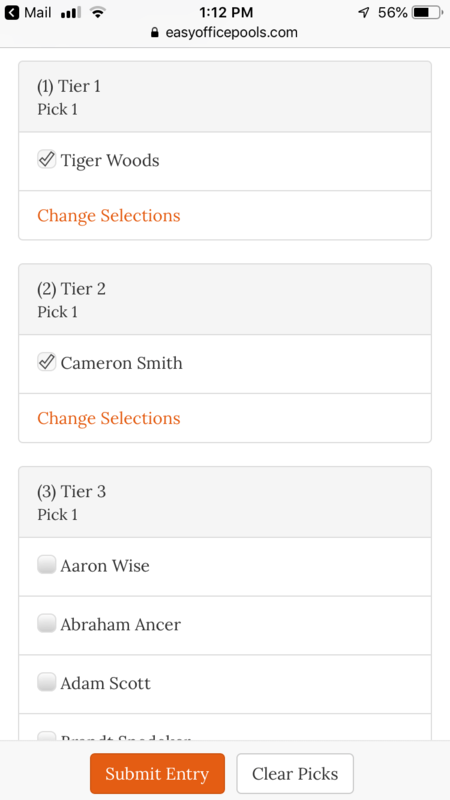 Simplified the premium pool setup screen to include 3 setup options: (1) 6 Tiers Use Best 4 Golfers; (2) No tier restrictions, choose anyone; (3) Custom setup where you get to define how the tiers are broken out. Allow users to choose entrant passwords instead of randomly assigning them. 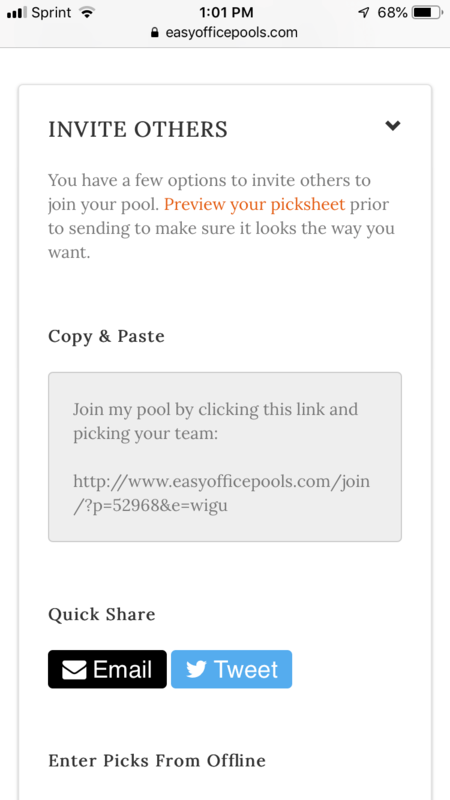 Added quick share features for inviting others to your pool. Enhanced the user interface so it is more clear on navigating the system. Resolved timing issues that caused confusion during the Masters Pool setups. Automated the password reset process to improve response time. Added player details popup that allows you to see player names, team names, and tiebreaker choice. Eliminated the $1 payment option for premium pools. March 2017 – Custom picksheet setup. Admins can assign specific golfers to specific tiers. April 2017 – Project $$ Earnings throughout the tournament. Dollar earnings are recalculated after golfer finish holes and move up or down the leaderboard. June 2017 – Daily Scoring. Use the best scores from each day to form your total score. Just like college golf. January 2018 – Added more flexible picksheet setup. Replaced long team number login with an email login. Cheers to your enjoyment of the golf season! For a Premium pool the total fee is 20 dlls or there are other fees to be paid? When can the masters pools can be set up? Sean – Just used the site for the Open and Pool and it is AWESOME. I got a ton of good feedback from the folks playing in it as I used to manually score and people had to wait for results. Now they could see in real time how fast they were moving up the board or in some cases falling quickly down it. I do agree with Rick above that some additional customizing would be great. For instance, I would like to be able to pick 2 players out of the top 10 rankings, then 2 players from 11-30, 2 from 31-50 and 4 from 51 and above or something like that. In a nutshell I would want to able to create the number of tiers, the amount of players in a tier and the number of players selected in a tier. Sounds like you are working that but all in all you have made my life much easier!!! Thanks for the feedback… We are working on this feature currently! Is there an option to score only 4 of the 6 players picked on the free pool? If so, how do I configure this? Our pool is up and running and everything looks fantastic. Love the functionality of the website and the ease of use. I have one question regarding the rankings. We are using a pool with 6 tiers of 15 golfers each. It seems that with the golfers listed by world ranking, most people ended up with very similar teams, by picking the golfer in each tier most likely to win. Have you thought about somehow ranking golfers first by Vegas odds to win and then by world ranking, to better align the field? Just a thought, something we did in the past when the pool was ran manually (before it got too big). Hello – Will there be a free version for the masters pool available or is it $20 regardless of setup? Thanks. Will the 2016 Masters pick sheet include the entire Masters field, or just those that fall within a certain World Ranking? When will the pick sheet be final? A couple of questions, I want to create a golf pool for my golf buddies. What I would love to do is have a pool every week (picking new players every week) and have a running pool that lasts all year taking the weekly results and adding them to the running totals for the year. If that is possible, if I go premium, is it $20 for the year or weekly? So, the NFL 33 pool had 19 winners this year. Do you think that you could change it to the NFL 50+, instead? I think there were only 3 or 4 teams that scored 50 or more points in a game this year. 19 winners in our 44 person pool, that is, in which we had several duplicate winners sometimes. Hi Phil – Thanks for the suggestion. I think there were a lot more 33 point games this year than in past years. I’m not sure if that is because of the new extra point distance or just random. I’ll definitely consider some changes so that there are around 4 or 5 scores that trigger a win, hopefully. Appreciate your feedback on how to make this pool better! Can I set up a golf pool where there are 12 teams and they pick 12 players each and the only thing that matters is money won on the PGA tour. Starting this week and running through the end of the season in September. Hi Roger – We do not currently offer this type of scoring system with our golf pools … only pools for single tournaments. I like this idea, though. Thanks for sharing. I’ll add it to the list for possible new pools to build. What if there will be no total dollar earnings per team until the end of the tournament? I don’t want people in my pool getting confused and thinking they won money that they didn’t. Also, does the free pool not have live scoring updates? We have a live draft. We want to have commissioner enter everyone’s picks. Is that option know gone? I have 20 guys but some of the guys are going to pick 3 sets of 6 players. Can that be done? So in other words I will end up with 26 (picks of six) spread across 20 guys. Hi Rick – I think I’m following. You can definitely do this. The guys that are picking 3 sets just need to use different team names for each of their sets. Let me know if that helps. Thanks! Is the fee for the entire season or will I have to pay for each tournament? Hi Dan- the fee is separate for each tournament. I would like to use the premium service for the daily scoring and the leaderboard features, but won’t use for golfer selection. I can upgrade to use these features after my pool is set up, correct? Exactly right. You’ll be able to enter everyone’s picks in a free pool and then upgrade after your pool is created. This will give you access to leaderboard and round by round scoring. Free pools can be configured starting Monday, April 6th. I am setting up a premium masters pool and have 2 questions. How can the members only see who they are picking and not the other members choices? Also I tried to edit my team and it says that the deadline has passed to edit (something about 1970) how can I edit my team? Hi Abbie- You should be able to edit your team now by click the “edit my team” on your view page. You’ll have to enter your credentials. Right now there is no way to hide everyone’s picks. I’ll try and tackle that for you. You’d like all picks hidden until the first tee off, correct? The same time that everyone will no longer be able to make edits to their teams? Yes I would like this for my group as well. Any progress on this? I have run a pool for the last 4 years where we pick 6 golfers and only allowed to pick the same golfer twice thru the four majors. Can it be set up just for majors for all 4 or do I have to restart it every tourney? You have to enter the teams separately for each tournament. You could use our free pool setup and manually manage everyone’s picks for each major, then enter their teams and our site will track the results automatically. Any thoughts you have would be greatly appreciated. We had no idea ESPN was dropping their site and we’re a bit panicked. Hi Andrew- sorry to hear about the discontinuation of your ESPN pool! Hopefully they bring it back. We aren’t collecting statistics at that detailed of a level so cannot accommodate this format right now. I’ll definitely add it to the list for long term consideration, though, in case there is more interest and we decide to collect more detailed stats. Sean, very kind of your to reply. Our group is very determined. We built our own custom spreadsheet where we will manually enter the scores for our golfers on each hole, but the calculations will take care of themselves. The more challenging part is coming up with salaries for the field, but we’re getting there. The Masters field is relatively small, so it’s easier than say the U.S. Open. Thanks for thinking of this in the future. ESPN was the only site I could find that used the team best ball format, which made for an exciting game. We are having the same issue. I have about 50 guys involved with ESPN Best Ball that is being discontinued this year. I think there is a market for someone to duplicate the format for those of us that have established leagues. We are in the same boat, loved the ESPN best ball, we have a very disappointed group of about 60 players looking for a solution, any luck yet?? I suppose you could take the salary caps off draft kings, we were thinking about doing it manually as well but seems like a real pain…. Hi Ronnie – As it is designed today you are required to setup a new pool for each tournament. Let me know if you have a specific format that you’d want and I can see how difficult it would be to add to the site and if it’s substantial we could negotiate one season long price. If anyone else stumbles upon this thread and would be interested in the same type of format please respond and I can make sure that I build something that would meet everyone’s needs. Hey Geoff- thanks for commenting. You should check out our PGA Money Earnings format …. It sounds exactly like your format and may be able to help. Can we configure a pool to providr points for top 10 finishers only? 20 points for 1st 10 points for 2 nd 9 points 3rd down to 1 for 10th? Hi Craig – Our pools cannot be configured as you descibed … you are only able to score it by strokes to par or dollar earnings.